Grandmothers teach their granddaughters to knit, right? Not for Jordan Chmura, Bay Path sophomore and nursing assistant at The Arbors in Chicopee. When she’s not busy attending class for her dual major psychology and pre-physician assistant degrees, working on her homework, giving back to her community, or sharing motivational speeches about overcoming adversity with colleges and community groups around the state, Jordan can often be found at work in The Arbors’ dementia unit, teaching a room full of grandmothers how to knit. Together they’ve knit over 60 hats, and are getting ready to donate them to children diagnosed with cancer being treated at Baystate Hospital, and to women at the YMCA. When Jordan first brought up the idea of teaching her residents to knit, there was some concern that their dementia might make the task impossible. 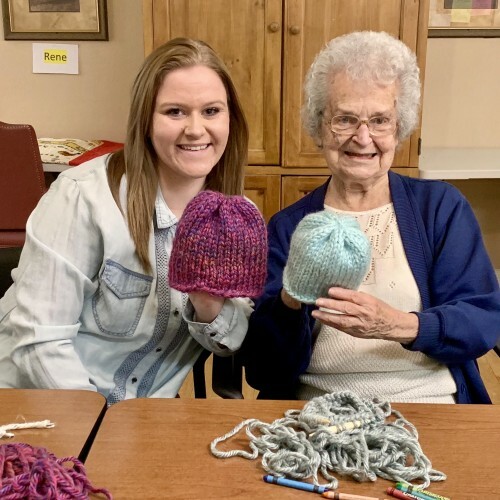 Having lived through quite a bit of adversity in her own life, the impossible isn’t something Jordan is afraid of, and soon thereafter she had residents rolling yarn, knitting hats, and perhaps most importantly, enjoying their time together. “They’re all my grandmas,” Jordan said, when asked about why this work was so close to her heart, and it’s clear her residents feel close to Jordan, too. Even when they can’t remember who she is, they remember her face, and her feelings, and are always checking in to see how she's doing if they feel something isn't right with her. For a group of women that many may consider unable to learn new skills, Jordan is using yarn and knitting needles to prove otherwise. And connections she has built. After struggling to adapt to on-campus life, as so many first-year resident students do, Jordan began to build relationships with faculty and students alike, relationships that now extend outside of the classroom. “Bay Path faculty go above and beyond for their students. They don’t have to, but they do” stated Jordan. Those relationships have grown to include Dean of Students Anne Chapdelaine, Vice Provost for Academic Affairs & Dean of Liberal Studies Dr. Kris Barnett, and President Dr. Leary. This March, Jordan will be a guest of Dr. Leary’s at the Women’s Leadership Conference. Jordan was first drawn to Bay Path after seeing Dr. Leary speak in her community, and was instantly attracted to her magnetism and the strength of her belief of what women are capable of. Jordan loves that knitting, both the skill and the finished product can be passed on. While she’s teaching these women how to knit, she’s passing on her “why not me?’’ attitude, too. That may be the best lesson of all.